Ghanaian actress Yvonne Nelson who was reported to have given birth to a baby girl some months ago has finally brought her cute daughter to the public’s eye. 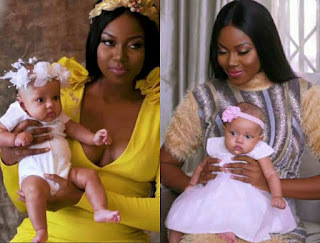 Yvonne was heavily criticized for having a child outside wedlock but she was not bothered about this saying that she was very comfortable with her decision as that was what she and her lover wanted. She welcomed a baby girl with a photographer Jamie Roberts in 2017 and has finally decided to let everyone see how gorgeous her baby is. Yvonne’s daughter was the cover of her magazine debut with Agoo Magazine. She also talked about how it feels being a mother which she said is an answered prayer. “People have been saying all sorts about why I’m having a baby whilst I’m not married. This is an answered prayer for me, they have no idea. Maybe one day they’ll get to hear my story.” She said. Yvonne and the Baby daddy have named the beautiful girl Ryn Roberts; she disclosed this in one of her post on social media.